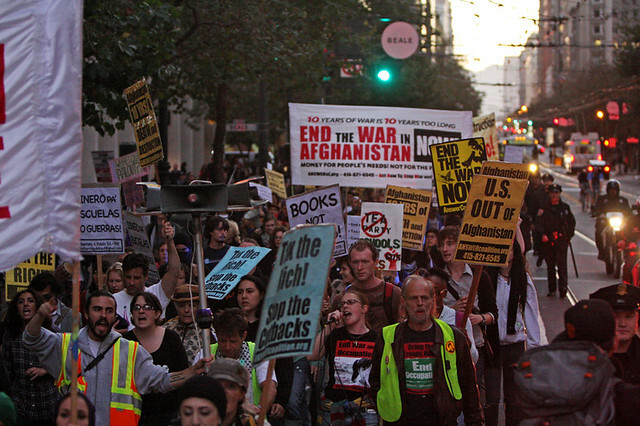 Occupy SF and anti-war demonstrators march down Market Street to the Federal Reserve Bank in San Francisco to demand the end the war Afghanistan on the 10th anniversary on Oct. 7. These protests are in solidarity with the Occupy Wall Street movement that began in September. Photo by Erik Verduzco. While this scene happened downtown, similar instances have been popping up at SF State as well. Protesters have been camping out in waves through the last few weeks as part of the Occupy San Francisco movement, which emerged from the New York-based movement Occupy Wall Street. The protest called for people to flood into lower Manhattan, set up tents and take over Wall Street for a few months, demanding that President Barack Obama convene a Presidential Commission to end the influence of money over our representatives in Washington. Among the group of protesters who have been camping out at Occupy SF are SF State students Dylan Brignon, and 18-year-old biochemistry major and Pedro Bazan, 18, undeclared. According to Bazan, occupiers are able to effectively communicate different ideas, share food and provide for one another. “People should come first, before the lobbyists and corporations,” Brignon said. Some of the Occupy SF encampment moved to Justin Herman Plaza Saturday. Police entered the plaza Sunday night and began removing tents and camping gear with city trucks. Rachel Schrader, 18, of Fremont, said that the people arrested were temporarily detained for obstructing traffic. The group had their first confrontation with the San Francisco Police Department two weeks ago when trucks from the Department of Public Works were brought to clear tents and other personal items from the camp. Protesters attempted to create a barrier with tables and chairs from neighboring businesses to keep the trucks from leaving with their belongings. Jeff Goldsmith, an employee at nearby company Autodesk, said he supports the movement, but that it is unfortunate that the people that are able to participate do not represent the majority of society. “Although many of us have the same politics, these protesters come from different cultures which bring about a lot of negative remarks from my coworkers,” Goldsmith said. Some businesses have not been negatively affected by the protesters at Occupy SF. Bill Hurt, an optician at the nearby office of Dr. Vera Szeto, said that although there was some Occupy SF graffiti put on a nearby flower shop, the movement has not affected their business and he supports their cause. Recently the protests spread to the SF State campus, as the new Occupy SFSU group met for the first time in front of the Ethnic Studies building Thursday in solidarity with the Occupy Wall Street movement. Several dozen students, professors and members of various organizations were in attendance. People made their voices heard and started discussing ideas, which lead to the formation of different committees. In order to bring awareness to the demonstration and to the rising tuition increase and budget cuts, Luke Barnesmoore, 19-year-old international relations major, pitched a tent outside the Cesar Chavez Student Center Friday. Demonstrators voted to hold general assembly meetings every Monday and Thursday at noon in front of the Ethnic Studies building.